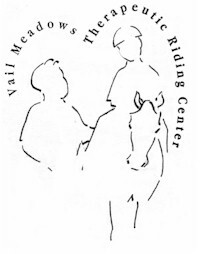 The mission of Vail Meadows Therapeutic Riding Center is to enhance the quality of life of special needs individuals of all ages, regardless of their financial status, by utilizing a holistic approach to life-skill development through therapeutic horseback riding instruction and education. The will be accomplished with love and compassion through our qualified riding instructors, therapists, educators, allied health professionals, and community volunteers. Our collaborative approach will result in enhancing the capacities, abilities and gifts of each person served in order to capture the full potential of the individual. The program will be conducted in harmony with the environment of the farm where all concerned will be encouraged to love and respect, not only themselves, but the horses they care for, as God's gifts. Horseback riding provides many physical benefits such as strengthening weak muscles, improving posture, relaxing spastic muscles, developing balance and coordination and improving circulation. The gentle gait of the horse, which so closely simulates the movement of the human pelvis, is a unique and valuable therapeutic tool. Psychologically, the rider benefits from being able to take an active role in moving from point to point without relying on an assistive device and/or other people. Self-confidence and self-esteem build as the riders learn to control the specially trained, gentle horses. Because riding is a dynamic rather than static method of exercise, it is a new and fun challenge to individuals. Gone are the repetitive and highly structured exercises usually associated with therapy. Riding is a recreational activity and in many cases, the riders will be more enthusiastic, will make a greater effort and will derive more benefits from such self-motivated therapy than from more conventional modes of treatment.